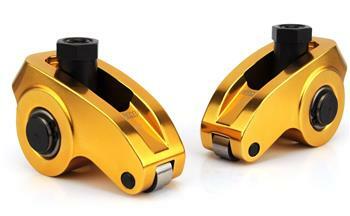 RHS Ultra-Gold ARC Roller Rocker Arm - Dezod Motorsports Inc - Home of the automotive performance enthusiast since 2002. One of the most important components in your engine is the rocker arm. It is also one of the most vulnerable. As the turning point of the valve train, the rocker arm is basically a sophisticated lever that redirects the upward tappet and pushrod movement and then multiplies it by the rocker ratio to downward movement at the valve. This is a highly critical process. Due to stresses and vibrations, which are more prevalent during high speed operation, rocker arms undergo what is known as deflection. Severe rocker arm deflection causes inefficient engine performance, and often results in metal fatigue leading to increased wear and friction in the valve train and eventually engine failure.